Hunting by bike can offer several advantages from minimizing scent to a stealthier approach, especially when chasing big game on public land. Like most serious DIY hunters, I have always believed in the importance of keeping in reasonably good physical condition for my age. Over the past 25 years, I have played basketball two to four times a week during the winter and rode a bike three to four times a week during the summer to keep in shape. In 2015, a knee surgery put an end to the basketball playing after all these years, so another form of physical activity is needed during the months when snows fly. I watched the recent growth of fat-tire bikes with a mixture of curiosity and skepticism, wondering if this was a way to fill a need for me. Then a couple of companies started making these bikes specifically designed for hunters. As I began to think about the possibilities, I finally took the plunge. It opened up a whole new world for deer hunting, uncovering advantages I never expected. There are several tracts of public land I hunt in the Midwest. There, I might walk a mile or more from a parking area to get to where I hunt. As I thought about these areas, I began to realize that most of the walking I was doing was on established two-track roads the state DNR personnel would use to plant food plots, check on the property and do their wildlife surveys. In fact, most public hunting lands have a network of access roads that are gated off to motorized vehicles but are open and recommended for walking — and biking — traffic. On one Kansas property, I have killed a couple of nice bucks in a funnel that’s more than a mile and a half from the road. It’s a long walk in the pre-dawn darkness. It’s difficult to get to the stand without spooking deer or getting sweaty under my outer garments. A fat bike turned this 40-minute hike into a 10-minute ride. With the power assist of an electric fat bike, I don’t sweat at all. Checking trail cameras and scouting are a breeze with a bike. You can do chores in half the time. On a recent trip to Kansas, I rode around the entire perimeter of a large crop field looking for scrapes and rubs, track and trails in just a few minutes, when scouting this out on foot would have taken at least an hour of my valuable DIY hunting time. I have discovered several more advantages to using the bike. Deer become very adept at recognizing the rhythmic steps of a walking human and the sound alarms them. But a bike is very quiet and deer do not spook at the noise it makes as it rolls along the ground, even in dry leaves. Over the years, I have biked a lot of trails near my home, and I have noticed that deer are not alarmed when I pedaled by on the trail. They would often just look up and watch me go by even when they were less than 20 yards from me. I was not surprised to discover that they mostly act the same way when I am accessing my hunting area on a bike. I can roll right by deer that would snort, flag and run off if I had been walking. Some will move off, but they do not show the signs of alarm that they exhibit when encountering a human on foot. This is a huge advantage when entering and exiting my hunting areas. One of the biggest advantages I have found in using the fat bikes is the ability to minimize scent intrusion. Typically, hunting a stand three to four times in a row can burn it. On foot, you leave so much ground scent each time you enter and leave the area. With the bike, ground scent is all but eliminated. Only your tires are touching the ground and you are moving much more quickly. This fall, I plan to use a drag rag behind a bike. It’s something I haven't tried yet, but the ability to leave an attractive scent on the ground without mixing it with human scent has me pretty excited for the potential. I can check my scouting cameras in half the time and leave a minimum of human intrusion. I roll right up to my cameras and exchange the cards quickly. The only scent I leave on the ground is right at the camera where I step off the bike. I not only use the bike for hunting and scouting, but I also use it for hanging stands. I can carry a stand on my back or load all my gear in a trailer. Some hunting bike manufacturers are producing trailers specifically designed for hauling gear into the woods and hauling a deer out. I am using the Crawler Deer Cart made by Hawk Hunting, which has four flat-proof wheels and pulls like a dream. Another simple accessory you will need to add is an LED light mounted to the handlebars. Having a bike along on hunts raises some questions, of course. How do you get the bike to your hunting area? What do you do with the bike when you are in a treestand? How much mud and rough ground can the bikes cover? Will it operate in snow? How does the bike perform in mud and snow? I have not yet tried to operate the bike in severely muddy conditions or in deep snow. I can say that it works in packed, light snow just as well as it works on dry ground. For muddy conditions and roads with a lot of puddles, which are very common, I can highly recommend getting fenders for your bike or everything on your back and in your trailer will be muddy from spray. What's the best way to haul your bike to and from hunting properties? The bike can be hauled in the back of a pickup or on a hitch mount. Keep in mind that these bikes are quite a bit heavier than normal bikes. My Fat Kat bike with 750 watt electric motor weighs 65 pounds. A heavy-duty bike carrier is necessary. I use a small enclosed trailer to haul my hunting gear to destination states where I hunt. I have set up a rack in the trailer for transporting the bike. Once I arrive, I usually leave the trailer in a motel parking lot and haul the bike in the back of my pickup where it is protected by the topper cap. I have found that putting a bike on a rack on the back of the truck means I will be cursed by driving wet gravel roads and getting the bike covered with mud. Seems to happen every time. 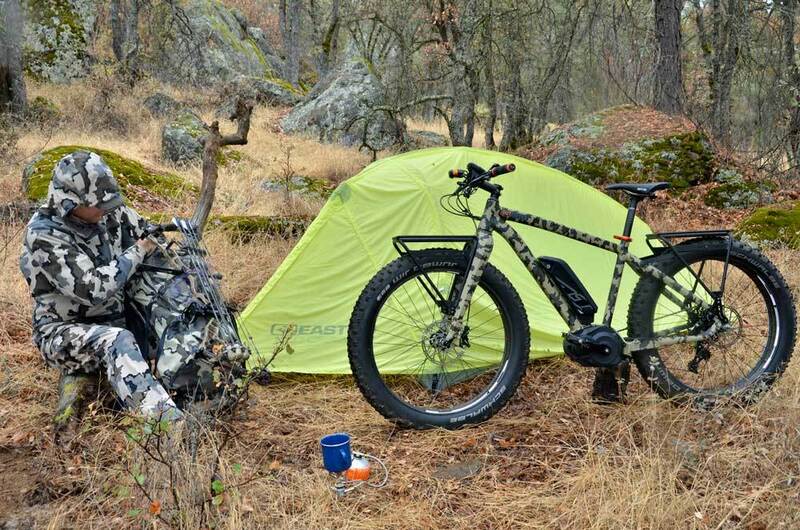 The author travels with his bike in a trailer converted to a hunting-gear hauler. Bikes can also go on a rack or in the bed of a truck. Are there some drawbacks and tradeoffs to using a bike? You bet. Getting a fully loaded bike over a fence can be a challenge. You may have to unhook a trailer or unload some saddlebags, but it can be done without too much effort. Same goes for fallen logs and creek crossings. There will be areas where you must get off the bike and walk it for a short distance. A treestand can be carried on your back while pedaling a bike, which means your backpack can be put on your front. This can make it hard to pedal up hills when you need to stand up and grind it out. When carrying a lot, I use the electric assist a lot more. Fat tires are notoriously thin-skinned and prone to flats. Some areas of the country have a lot more stickers and thorns than others. If you hunt in an area with a lot of thorny plants, you will probably want to fill the tires with a run-flat substance right from the start. You will learn quickly not to overload the bike's backend. In fact, this lesson is often learned the first time you go up a steep hill. Take my word for it. If you are loading saddle bags with gear, make sure you distribute some weight on the front of the bike to offset it. Most hunting locations will be a combination of easy going and hard going. I mentioned earlier that most public-hunting lands have service roads, which make traveling a breeze. But there will be places you must go cross-country at times, so keep in mind that there will be trade-offs. Having the electric assist is a huge advantage in rough ground. Overall, I am pleased with the advantages a fat-tire bike gives me for hunting public land. I'm sure I will continue to find new uses and advantages as I use the bike more and more. Next spring, I plan to use the bike for shed hunting. This fall I'll try the bike on an antelope hunt and, later, maybe a bear hunt. Who knows what possibilities it may bring?